The 2019 Awesome Walls Schools Comp is GO! 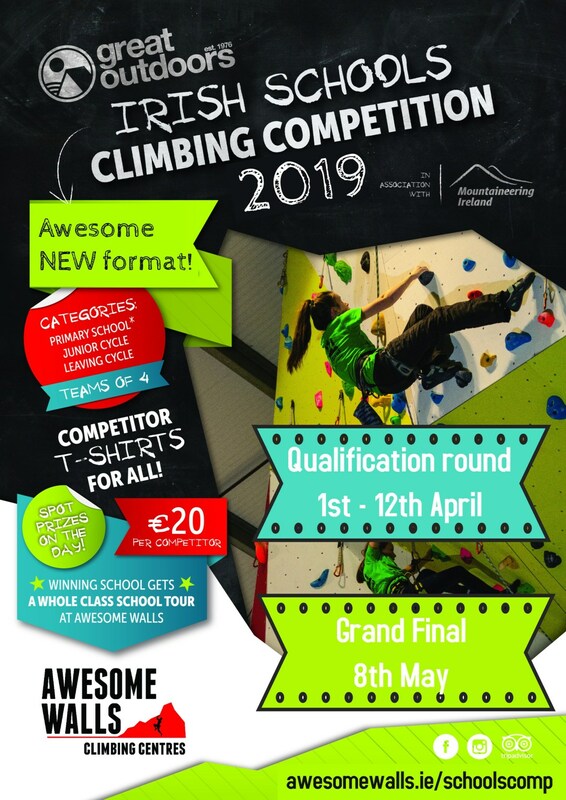 The Irish Schools Climbing Competition is an annual event put on by Awesome Walls, Great Outdoors, and Mountaineering Ireland. Qualifiers are running from 1st April to 12th April, with the Grand Final on the 8th of May. Schools were able to enter teams of 4 or individual climbers to compete in a number of roped climbing and speed climbing challenges. The top scoring 3 teams from each of the following categories are to be invited back for the Finals. The winning school and team members will receive prizes provided by The Great Outdoors and Awesome Walls, with spot prizes on the Grand Final day and a great atmosphere guaranteed!